It’s official. 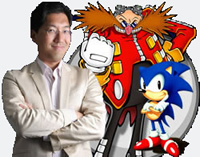 As of June 1st, Yuji Naka will no longer be at Sega. According to Gamespot, Naka is heading off in his own creative direction, starting a new game developer called Prope (Latin for beside and near future) that will focus solely on new properties. After more than two decades at Sega, Naka is stepping down as its creative officer for research and development, as well as head of its most famous development group – Sonic Team. This is akin to what Tetsuya Mizuguchi did a few years ago, when he left Sega to start Q Entertainment. Yu Suzuki also received more creative freedom through his studio, Digital Rex but has since returned to head AM Plus, so this move on Naka’s part might not be 100% set in stone, depending on how things turn out. Most Sega fans are probably already wondering how this affects the company’s mascot and star franchise. Who will head future Sonic games? Where will the Blue Blur go from here? Since his debut in 1991, Sonic the Hedgehog has enjoyed Naka’s leadership and guidance. Though rocky since entering the 3D realm, Naka has helped to maintain the series relevant through three hardware generations, with a “rebirth” of source in the works for the Xbox 360 and Playstation 3. How this new Sonic game will turn out without him is anyone’s guess, and I hope that Sega knows what it’s doing. As one of the chief creators of the Hedgehog that toppled Mario (notice I said one of, as many people tend to forget Naoto Ohshima, who deserves just as much credit), Naka has been involved with virtually every game, and it’s kind of odd to think of the franchise continuing on without him. Does this mean that Yuji Naka has severed all ties with the company that made him a superstar? Hardly. His new company is 10% owned by Sega, who still retains exclusive publishing rights to anything he produces. This is all a part of Sega’s Game Creator Independence Program, which sort of turns in-house developers into 2nd parties (think Rare with Nintendo). The teams can now create any game they want, as opposed to carrying out instructions by Sega. In return, the big “S” gets publishing rights. It’s a win/win situation for everyone involved, and since Sega no longer has to support a single platform, the possibilities are quite endless. This, I suppose, is another nail in the coffin of the publisher someday planning to get back into the hardware business. So we at Sega-16 say good luck and godspeed to one of Sega’s most brilliant and creative minds. As far as the games are concerned, nothing should really change except the addition of the Prope logo on the back of the box. If this means the man can finally let loose and be as inventive as he wants, then so be it. As long as they’re fun, people will still look for games involving Yuji Naka.